MANHATTAN BEACH, Calif.--(BUSINESS WIRE)-- Footwear industry leader Skechers USA, Inc. (NYSE:SKX) on Friday celebrated a new era and commitment to global growth and its hometown community by breaking ground on an expansion of the Skechers Corporate Headquarters that will span several adjacent buildings in Manhattan Beach and Hermosa Beach, California. The project will more than double the Company’s office, design and showroom space in the South Bay, bringing it to just over 330,000 square feet. 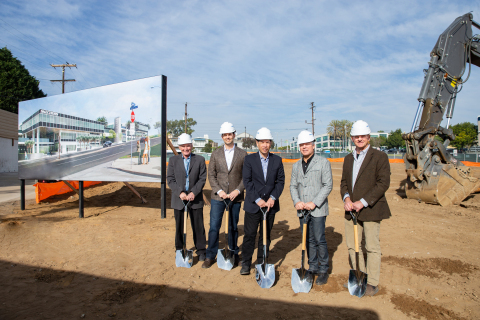 At the centerpiece will be a more than 100,000-square-foot Design Center as well as neighboring Executive Offices on Pacific Coast Highway in Hermosa Beach. Additionally, there will be an expansion to the existing building at 330 South Sepulveda Boulevard and a new office across the street in Manhattan Beach. All buildings are being developed with sustainability in mind to achieve LEED Gold certification upon completion. Earth-friendly features will include solar panels, daylight harvesting and motion-controlled lighting, high-performance glass, R30 insulation, and Forest Stewardship-certified wood. Additionally, landscaping will utilize drought-tolerant bio-filtration planters with low-water use plumbing and irrigation. And Skechers will continue its ongoing commitment to reduce waste at every level across the entire corporate headquarters—from recycling services to eco-friendly kitchen materials. A component of the project will be a beautification of the corridor that had become in disrepair due to the closing of several businesses. This will include a “Welcome to Hermosa Beach” sign at Longfellow Avenue and Pacific Coast Highway that will be designed by a local artist as well as the undergrounding of utilities plus improvements to benches, sidewalks and bus stops. The buildings will be designed with increased setbacks and landscaping. Additionally, the project includes subterranean on-site parking for all Skechers employees. The new Skechers Corporate Headquarters has been designed by architect David Forbes Hibbert, founder of DFH Architects, an independent, award-winning architecture firm with over twenty years experience. The firm also designed and developed the original Skechers Corporate Headquarters building at 330 South Sepulveda Boulevard as well as notable projects like Universal Music Headquarters in Santa Monica and the k2LA Apartments in Koreatown.